Fine pattern grass kunaa from G.Dh. Gadhdhoo were used as royal gifts in the past when these mats were given as gifts to the Dutch and British governors of Ceylon from the Sultan of Maldives. These were sometimes trimmed with gold lace work. At present grass mats are given to foreign dignitaries as gifts. Designers of tourist resorts and hotels use kunaa as floor mats and wall hangings. They are very popular as souvenirs to tourists too. Kunaa weavers cultivate their own grass and collect the leaves and roots which are used for dyeing. 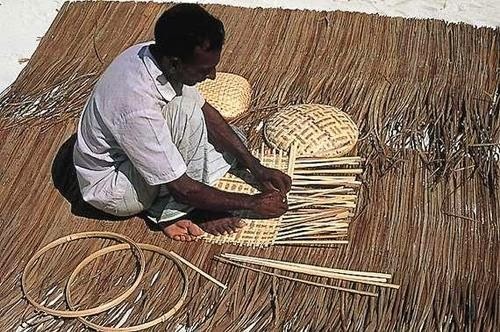 The designs in these kunaa are in four colors – natural, yellow, brown and black. The bark of the ‘uni’ tree is dried and powdered to prepare ground dye. To make the black dye, the brown-dyed grass is first soaked on a bed of uni leaves until the water evaporates. This grass is then boiled in a mixture of coconut oil and water. The liquor is left to cool till the water evaporates. This whole process is repeated three times after which the grass is washed in the sea and dried in the shade. To prepare the yellow dye pieces of root from the ‘ahi’ tree are soaked, then boiled together with the grass for about two hours. After which the grass is boiled in liquor of fresh water, sea water, and ground turmeric for about an hour. To prepare natural color, the grass is bleached in the sun for a week. These mats are woven to traditional patterns with small variations which are usually introduced by individual weavers. Sleeping mats, prayer mats, swing seat mats, etc each have specific patterns. Each of these patterns have a name such as ‘cutlines design’, ‘lockmat’, ‘large mat’ ‘dhigulu kunaa’, ‘gon’di kunaa’ and ‘namaadhu kunaa’, etc. Beauty and complexity of the design usually determine the price of these mats. Aerial views of Male', the capital of Maldives. The little Jinn girl I met. The vow that Fanniaru Kaleyge made. Maldivian Buddhist heritage in Sri Lanka. What is the Mahl language? Bandiya - a devotional dance to Durga. Bo tree in the Maldives. Maliku Lullabies - a dying tradition.